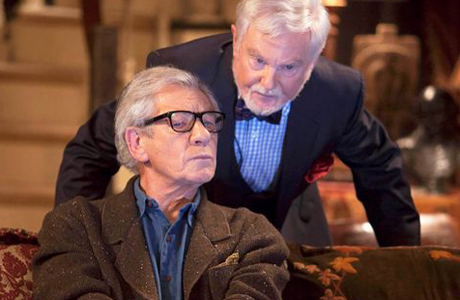 Acting greats – and real life friends – McKellen and Jacobi play Freddie and Stuart, a gay couple who have been living together in the same Covent Garden apartment for nearly fifty years and whose lives now basically consist of bickering with each other and walking the dog. The arrival of their new upstairs neighbor (played by Game of Thrones’ Iwan Rheon) shakes things up a bit. The first season received mixed reviews from critics, but premiered strongly, with 5.7 million viewers tuning in to its premiere back in April. While those numbers did fall off a bit over the course of the show’s run, they remained fairly steady – and that fact, combined with the star power involved, makes the series’ renewal not entirely surprising. No hints have been dropped thus far about what about what a second season will look like, story or cast-wise. Jacobi, however, has previously speculated that production on Series 2 is unlikely to start before 2014, due to his co-star McKellen’s busy schedule (the actor is currently doing a play with Sir Patrick Stewart that’s headed to Broadway this Fall). There’s also no word about when we might expect to see the comedy transmit here in the States, though entertainment publication Deadline is reporting that “negotiations are under way”, though it does not mention on which network we might expect to see it. Keep an eye out - and we’ll keep you posted! Are you curious to see Vicious for yourself? Excited about the prospect of a second season?